Despite the many negative reviews that I’ve written over the years in this blog, nothing pleases me more than opportunities to praise something that’s exceptionally good. 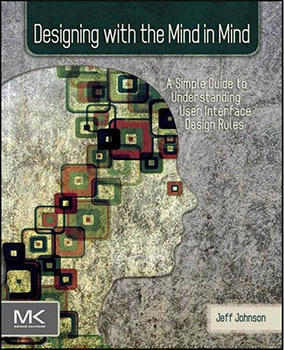 A new book by Jeff Johnson, Designing with the Mind in Mind: A Simple Guide to Understanding User Interface Design Rules, gives me just such an opportunity. Even before opening it for the first time, I felt confident that this book would be worthwhile, based solely on the fact that Stuart Card wrote the foreword. Card is one of the smartest guys I know. His research in the fields of data visualization and human-computer interaction is some of the best. It always digs its roots deep into the soil of human perception and cognition, growing insights and best practices in design from an understanding of human needs and abilities. Jeff Johnson, who at one time worked with Card at Xerox, writes in this same spirit. This book teaches software design practices that, as the title suggests, directly address what science has revealed about the abilities and limitations of our brains. Anyone who has a hand in developing software applications that people interact with should read this book. That includes those who build data visualization applications, such as custom analytical applications and performance monitoring dashboards. Computer technologies that are supposed to help people think will only work if they’re designed to interact hand in glove with human perception and cognition. This book distills the most important insights we’ve learned about how the human brain functions for the purpose of human-computer interaction, explains them simply, clearly, entertainingly, and in practical terms, then goes on to teach design principles that should be followed to build systems that people can interact with productively and enjoyably. Unlike the cookbook approach to guidelines of many design books (do this, don’t do that, and don’t ask why), Johnson explains enough about the inner workings of our brains to help us make sense of the guidelines. Only when we learn the “how” and “why” of rules can we apply them skillfully, especially when faced with novel situations. True to the lessons that he teaches about interacting with the human brain, Johnson writes in a manner that is always on message, understandable, and thoroughly enjoyable. Even though I was already familiar with much of the material in this book—not surprising given my interest and extensive reading in the field—I was delighted by how much I learned. Several insights were new to me and a few things that I thought I knew well were expanded and corrected to some degree. For example, Johnson’s description of short-term and working memory, based on the latest research and conceptual models, revealed that my understanding was over-simplified and definitely outdated. In the final sentence of the book’s foreword, Stuart Card wrote: “Above all, this is a book of profound insight into the human mind for practical people who want to get something done.” I wholeheartedly agree.